As quick as 11.1 seconds over the quarter! The 1980s brought some truly woeful music and hairstyles but there’s one thing that we can all be thankful for – the turbo craze! You probably know that the late ‘70s/early ‘80s Formula 1 and Group B rally machines pushed the limits of turbocharging. The lessons learnt in motorsport then trickled down to road cars of the early ‘80s and we’ve been enjoying the fruits ever since. Well, despite their low profile, there was a handful of factory turbocharged bikes that appeared in the ‘80s. These bikes promised ‘big bike’ performance in a relatively modest size frame as well as cutting-edge small-turbine technology. The world’s first mass-produced turbo motorcycle is the 1982 Honda CX500TC Turbo. Honda took their ground-breaking bike very seriously and invested a huge amount of R&D to ensure the new technology would perform reliably. The CX500TC Turbo employs a water-cooled 500cc V-twin boasting an electronic fuel injection system to aid smoothness and response. 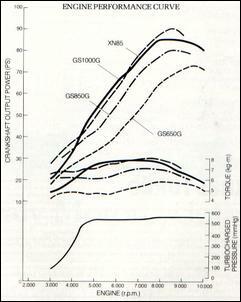 Despite breathing through relatively low-tech SOHC heads with pushrods, the CX500TC engine produces a creditable 60kW at 8000 rpm and 79Nm at 5000 rpm. Simple. With a lowly 7.2:1 static compression ratio and up to 19 psi of boost pressure! Driving through a 5 speed gearbox and shaft drive, the CX500TC Turbo is, as you’d expect, ‘on-off’ in its torque characteristics. It reputedly feels like an overweight 500cc naturally aspirated bike when off boost; on boost is a different story... Weighing 264kg (with fluids) the CX500TC Turbo can run the quarter mile in around 12.4 seconds – not bad for a stocker! With telescopic front suspension and Honda’s ‘Pro-Link’ rear, the CX500TC Turbo offers 13 and 10.4cm of travel respectively. It is said to handle well despite being relatively top-heavy. The Honda proved quite popular with 5400 units sold through 1982. 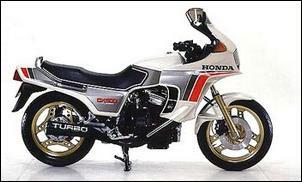 After a year of selling the CX500TC Turbo, Honda released a new-and-improved model – the CX650TD Turbo. Sold only through 1983, the CX650TD Turbo boasts a 150cc larger capacity engine, higher 7.8:1 static compression ratio, bigger valves with more lift on the inlet, EFI controlling the fuel and ignition, a new IHI turbocharger and boost pressure lowered to around 16 psi. Peak power rose to 73kW. Straight-line acceleration was improved in accordance with the bigger motor - the quarter mile now took a shade under 12 seconds. In-gear performance is scintillating – nothing could touch it for useable, mid-range grunt. Yamaha responded to Honda’s original CX500TC Turbo with its own boosted bike – the late 1982 XJ650 Turbo. At a time when Yamaha was struggling with finances, its entry into the world of turbocharged bikes was a relatively low-key one. Using the existing Yamaha XJ650 as the platform, the company avoided adopting fuel injection and relied on quad blow-through Mikuni carburettors. A small Mitsubishi-based turbocharger blows into the DOHC, 8 valve, 653cc four-cylinder. Interestingly, the engine relies on air-cooling only and, despite scepticism when released, the engines have proven very reliable. With a 8.2:1 static compression ratio, the 653cc four was initially boosted to around 9 psi and came rated at 66kW at 9000 rpm and 81Nm at 7000 rpm. The quarter mile journey takes around 12.7 seconds – quite slow compared to the Hondas. Interestingly, Yamaha released a "Power Up" kit for the owners of early XJ650 Turbos. The kit comprises a stronger actuator spring and a washer that goes inside the right-side muffler (probably to restrict flow through the wastegate bypass). 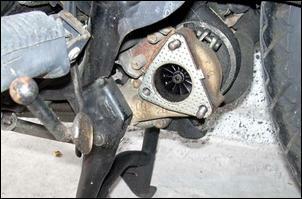 With these two mods, boost pressure crept up to 12 psi. 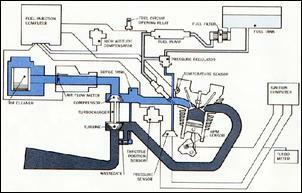 Note that this kit and a larger fuel tank came as standard fitment to 1983 models. And this begs the question – how much boost can you run? Well, by disconnecting the wastegate and relying on the plenum pressure relief valve, you can run 14 psi. This is enough for a flat 12 second pass. The XJ650 Turbo straddles the line between sportsbike and touring bike – and falls somewhere in between. Like the Honda, the XJ650 Turbo is relatively top heavy (and suffers from the added weight of the turbocharger system) but its older chassis has its flaws. Thicker forks were released in 1983 but it did little to change the overall handling deficiencies. 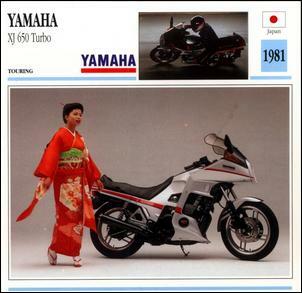 As the result of poor sales, the Yamaha XJ650 Turbo was sold only until the end of 1983. Approximately 6500 units were sold in its first year and only around 1500 shifted in its final year. Honda may have been the first company with a mass-produced turbo motorcycle but it’s possible that they got the idea from the 1978/1979 Kawasaki Z1R TC Turbo. We must point out that the Z1R TC Turbo was never sold as a ‘proper’ Kawasaki product. 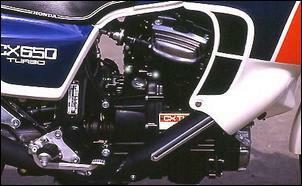 Assembled by the Turbo Cycle Corporation using ATP turbocharger kits, the Z1R TC Turbo was sold to the public through a limited number of American Kawasaki dealerships. Oh, and they didn’t come with a warranty! Using a Rajay turbocharger (as used in ATP’s off-the-shelf turbo kit), the Z1’s substantially-sized 1015cc air-cooled DOHC four-cylinder is boosted to around 6 – 8 psi. The standard quarter mile performance of this machine is 10.9 seconds! Changes to law in California during 1980 made it illegal for this awesome bike to continue its factory-backed sales. The Kawasaki Z1R TC was discontinued for 1980 - around 500 were sold. Hot on the heels of Honda and Yamaha’s turbocharged bikes came the 1983 Suzuki XN85 Turbo – the rarest of all mass-produced turbo bikes. 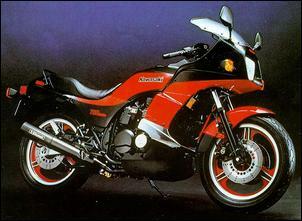 The Suzuki followed a different direction to its turbo forbearers – it was a pure sportbike rather than a sports/tourer. It also brought the first factory 16 inch wheel – something previously exclusive to race bikes. Low-set handle bars, rear-set foot pegs and single damper, full-floater rear suspension added to its sporty nature. Using an air-cooled 673cc four-cylinder with a DOHC 8 valve head, the XN85 employs Nippondenso fuel and ignition control and an IHI turbo producing 0.73 Bar from about 5000 rpm up. Peak power is 63kW at 8500 rpm. Drive is sent through a 5 speed gearbox and chain drive and, weighing 236kg, the XN85 is a mid 12 second bike. With boost pressure flattened off to 0.73 Bar from 5000 rpm the XN85 is very progressive – some say boring – to ride. However, this controlled torque delivery helps bring the bike together as a true sports machine; it’s said this was the best handling sports bike of its era. 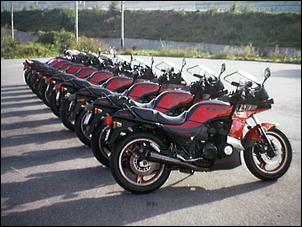 A total of about 1150 Suzuki XN85s were sold between 1983 and 1986. Sales were not helped by Suzuki’s decision to introduce the lighter, faster and cheaper GS750ES – perhaps they saw the writing on the wall for turbo bikes. 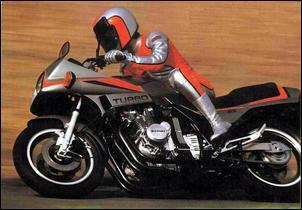 The last turbo bike to arrive in the ‘80s was the Kawasaki Z750 Turbo. The Kawa is powered by a big 738cc air-cooled four-cylinder with a DOHC 8 valve head. With minor internal strengthening, a 7.8:1 static compression ratio, EFI and a Hitachi HT-10B turbocharger, this beast cranks 82kW at 9000 rpm and 99Nm at 6500 rpm. With 5 ratios and chain drive, the Z750 Turbo was described as "a milestone in motorcycling." More than any of its turbo rivals, this bike achieved big bike performance in a mid-size frame – it didn’t have the bottom-end hole of, say, the early Honda. With adjustable front forks and Kawasaki’s ‘Uni-Trak’ adjustable single damper rear (for 13 and 10.4cm of travel respectively), the Z750 Turbo was a stable handling machine with probably the best overall balance for street use. Around 600 examples were sold from 1984 to 1985. Unfortunately, despite the efforts of Honda, Yamaha, Suzuki and Kawasaki, the turbocharged road bike concept was dead by the mid ‘80s. Buyers preferred a bigger engine bike with plenty of bottom-end grunt, better response and a wider power band. 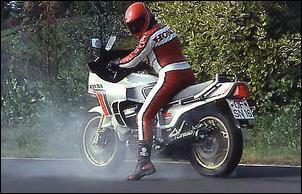 The turbo bikes also suffered from added weight, which offset some of their advantage over a bigger-engine’d bike. Turbo bikes were a spectacular concept but, in hindsight, they offered no major overall advantage over a big-cube engine. Still, these remain some of the wildest machines ever built – just ask anyone who has ridden one!